At IFA 2017, Alcatel a new member to the Idol smartphone range with the Idol 5. Not a flagship handset by any means, the Idol 5 is an affordable budget handset that appears to attempting to appeal to the social media minded. 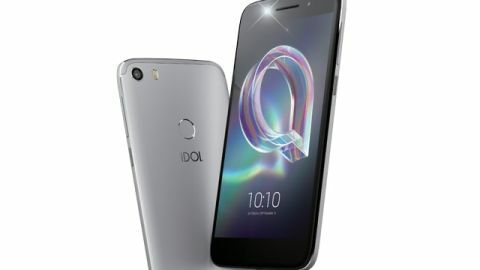 Following on from the competent Idol 4, the Idol 5 offers a 5.2-inch Full HD display, a competent 13MP rear camera and some nice social features that edge more towards useful than gimmicky. The Idol 5 was announced at IFA 2017 but you won't be able to get your hands on it in the UK until September 15. The phone is currently available for pre-sale exclusively through Amazon, where you can secure it for £189.99. The Idol 5 is a sleek-looking smartphone. The way the 2.5D glass of its display meets the matte aluminium casing is stylish and understated and it certainly helps the phone look more expensive than it is. It’ll be hard for the Idol 5 to stand out, though, given that there are only two color choices - metal silver and metal black. We didn’t get the chance to see the metal black model but though the metal silver looked perfectly nice and the metal was smooth and pleasant in the hand, it didn’t particularly blow us away. The phone’s edges are smooth and pleasantly curved. Thanks to its 5.2-inch display, the phone isn’t particularly hard to hold in one hand and we didn’t struggle to reach our thumb across the screen to reach even the furthest away apps. We found the Full HD screen bright and crisp when we used the phone and though Alcatel isn’t trying anything groundbreaking or bezel-pushing like high-end manufacturers, it’s created a screen that does exactly what it needs to, no more and no less. Always a controversial choice, the phone’s fingerprint scanner can be found on its back. We didn’t get the chance to try out how accurate it is, however we were glad to see that it’s placed far enough away from the camera lens that any instance of smudging your lens while you unlock the phone is next to zero. On the Idol 5’s top you’ll find the increasingly uncommon 3.5mm headphone jack, while on its bottom there are two speakers flanking a micro USB charging port. As you’d expect, the phone’s volume controls and conveniently located on its side. When it comes to battery, the Idol 5 isn’t in a strong position. It only offers a small 2,800mAh battery and though the Alcatel representative we spoke to told us this should last a whole day, he added that this wouldn’t be the case with heavy use. Given that this is a phone being targeted at those who frequently use their phones to capture and share their lives online, this seems like a serious problem. A small battery was also a problem on the Idol 4 and it’s frustrating to see that Alcatel hasn’t really stepped things up here. That said, what they’ll be capturing should at the very least look good, though not great. The phone sports a fairly standard 13 MP rear camera and 5 MP front-facing camera. The rear camera appeared to perform reasonably well when we tried it out, but we’d prefer to take a few more shots in different conditions before making a final judgement. The phone does offer some neat software features for the camera which help it do something slightly different. We got the chance to try out its cinematography mode which allows you to shoot video and then choose which parts of the video you’d like to stay still and which you’d like to move. This is a neat feature and made for an interesting video, however, the software doing the work was quite slow and the phone seemed to take a while to edit and finalize the videos. Under the hood you’ll find a MediaTek MT6753 Octa Core chipset and 3GB of RAM. Other than struggling with the more demanding camera software features, the phone seemed swift enough in terms of moving between apps in our limited test. However, we'll be interested to test this further in a full review. There’s only 16 GB of storage on offer with the Idol 5 which may not be enough for those who really will use this phone to record and share their lives. Fortunately, there’s the option to expand the storage up to 128 GB using a micro SD card. The phone is running Android 7 software, but it’s worth bearing in mind that Android Oreo is coming. How long it’ll take Alcatel to push the software to the Idol 5 we’re not sure, but it’s likely to be a priority handset. Something the phone offers that you won’t get anywhere else is its App Cloner function. This function allows you to stay logged in on multiple accounts on a single social app. For example, if you have several Instagram accounts, or both private and public Twitter accounts, you’ll now be able to stay logged into all of them on a single device and access notifications for both. We only got to see a small part of this in action but it seems like a neat solution to an irksome problem. Overall, the Idol 5 looks like your standard budget smartphone - though its specs won’t make it stand out, you can’t really expect any more for the price that you’re going to pay for it. Though the battery is definitely a big drawback, the App Cloner function is a genuinely neat solution to a problem a growing number of us are experiencing and it’s nice to see Alcatel address it in their budget handset.